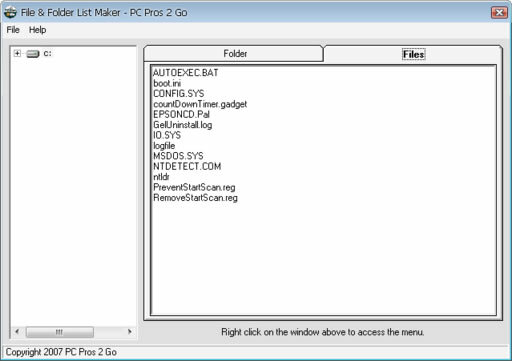 File & Folder List Maker was a small piece of Freeware created by PC Pros 2 Go many years ago. This software was developed for Windows XP and its results for Windows Vista and Windows 7 were less than favorable. The goal of the software was to create a simple list of files or folders in plain text so that you make copy this list and do what ever you needed to do with it. File & Folder List Maker was developed in Visual Basic 6 and was never friendly with newer forms of Windows. We have also stopped supporting the software. Maybe one day we’ll remake the software in .Net but at this time we don’t have any current plans of remaking File & Folder List Maker. For the time being we are still offering the ability to download the software from us. If you still wish to download File & Folder List Maker please click the download button below. PC Pros 2 Go will not be held responsible in the event the software does not work on your system or cause any harm to your system. While we have never heard from anyone stating it damaged their system, we just want to make sure you are aware that you take full responsibility. In the event you download and run the software and notice nothing is happening, be assured that the software is running. And you will need to terminate the software through Windows Task manager.